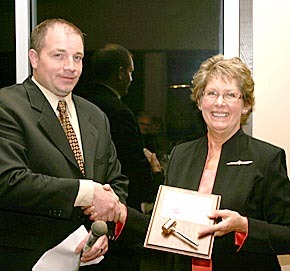 Shirley Petsche of Petersburg began her term as 2010 president of the Albion Chamber of Commerce during the community banquet on Sunday evening, Jan. 31, at the Albion Country Club. The banquet is held annually by the chamber and Boone County Community Foundation. Jeff Temme served as master of ceremonies, and 96 people attended. Scott Reilly, outgoing chamber president, began the program by introducing chamber board members and reviewing the past year’s activities. Three new businesses were welcomed to the community in 2009. The program included a presentation by the Boone County Area Foundation and entertainment by Boone Central High School speech students. Read the Feb. 3 Albion News Print Edition for details.